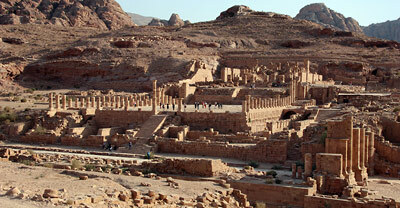 Qasr al-Bint Far'un was Petra’s main temple. 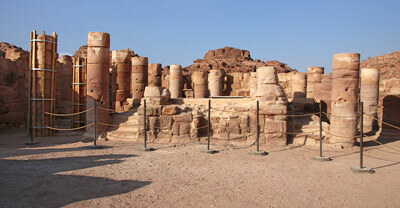 The name was given to it by the Bedouin, meaning "Castle of the Pharaoh's Daughter," and derives from a local legend. 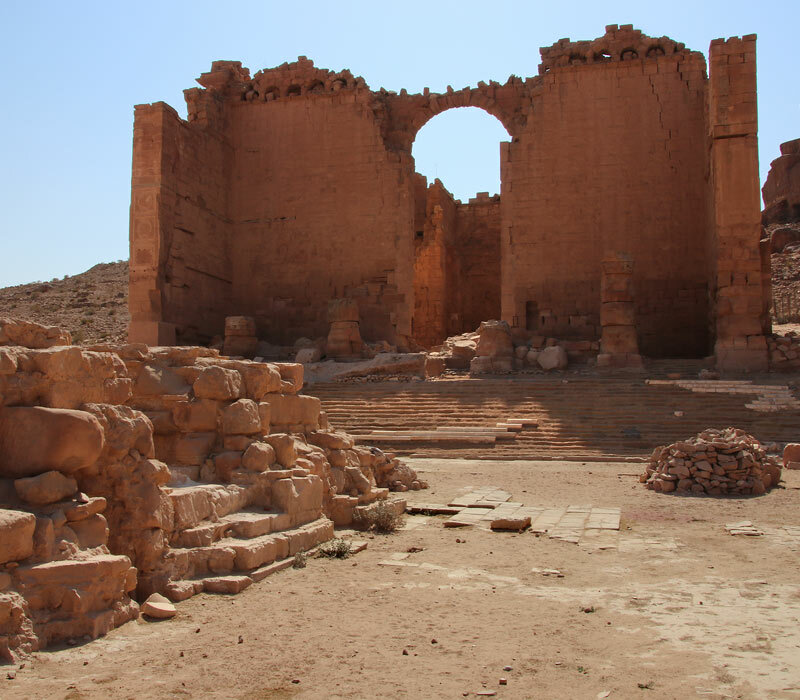 It was probably built during the second half of the 1st century BC, during the reign of Obodas III, consecrated to the main Nabataean god Dushara, or center of a joint cult of Dushara and the goddess al'Uzza. At the end of the Colonnaded Street, a monumental triple-arched gate marks the access to the sacred open precinct of the Temenos. The worshippers would make their offerings (probably sacrifices) on an altar in front of the temple. The temple itself, set on a podium, accessed through a wide staircase and a four column pronaos (portico), would be exclusively reserved for the priests. It is 23 meters high, has a square floor plan of 32 meters side, and is built with blocks of rose sandstone with an inner fill of smaller stones and mortar. The temple sanctuary is divided in three compartments. The middle one protected an altar platform that housed images of the deity. The two lateral ones had a kind of mezzanine or balcony. They were accessed through stairways logged in the walls. Qasr Al-Bint had remarkably rich inner and outer stucco decorations, remains of which can still be seen on site. In both its architectural layout, and its decorative scheme, the temple is one of the most original monuments of the Hellenized Near East.